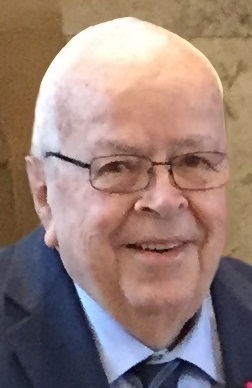 Martin John "Jack" O'Connell, 83, of Girard, passed away peacefully on Monday, February 11, 2019, surrounded by his family. Jack was born September 20, 1935 in Youngstown, Ohio, the son of Martin D. and Isabel (Mylott) O'Connell. He leaves to cherish his memory, his wife of 61 years, Janet L. (Gantar) O'Connell, the love of his life, whom he married October 26, 1957, Their children; Kathleen (David) Sauline, of Girard, Maureen Haska, of Edinburg, Danny (Abbie Nicole) O'Connell, of Girard, Laureen (Dan) Brinker, of Girard and Christeen (Randy) Partika, of Coitsville, his brother, Robert (Darlene) O'Connell, of McDonald, grandchildren; Jessica (Doug) Foster, Janet (Michael) Russo, Mary (Nick) White, Grace (Philip) Rockwell, Martin (Alexis) Brinker, Scott (Kristie) Partika, Annie Partika, Abbey Partika, Emily Partika, and Jesse Wilson, and great-grandchildren; Margaret Russo and Donovan Martin Partika. Besides his parents, he is preceded in death by his sister, Eileen Senich and son-in-law David Haska. Jack served the Mahoning Valley for many decades as a labor leader and community volunteer who impacted the lives of many people. Jack served as Business Manager for the Plumbers and Pipefitters Local 87 as well as executive secretary for the Western Reserve Building Trades. Jack was the first non-steelworker to serve as president of the local AFL-CIO. Throughout his labor career, he served as labor liaison for former Congressman Jim Traficant and worked as a regional representative for former Ohio Attorney General Lee Fisher. After retirement, he continued to play an active role to ensure the availability of services for older adults. Jack was a founding member of the Girard Multi-Generational Center, serving as Chairman of the Board for 16 years, the gymnasium was dedicated the “Jack O’Connell Gymnasium” in 2016. Jack also served as president of the Area Agency on Aging for 18 years. In 2007, Jack was inducted into the Ohio Senior Citizens Hall of Fame. Jack also served on the Youngstown State University Board of Trustees, Supreme Court of Ohio Board of Commissioners on Grievances and Discipline, Board of Trustees at Hillside Hospital, Board of Directors of Mahoning Valley Economic Development Corp., the Board of Directors of the MVSD, Girard City Council, President of Trumbull Metropolitan Park Board, and numerous additional Boards. The family will receive friends and relatives at St. Rose Church on Friday from 4:00-8:00 pm and Saturday from 10:00 to 11:00 am. Jack was a member of the Ancient Order of Hibernians in America, Mahoning County Division 6, and the AOH prayer service will take place at 7:45 pm on Friday. A Mass of Christian burial will be held Saturday, February 16, 2019 at St. Rose Church in Girard at 11:00 am. In lieu of flowers, donations can be made to the Multi-Generational Center, 443 Trumbull Ave., Girard, Ohio 44420, in Jack's memory. Visit www.blackstonefuneralhome.com to view this obituary and to send any condolences to the family.